I’ve been waiting for my new year, one word mantra to come to me. I was afraid I wasn’t going to receive it. However, as I sat talking with my doctor last week, it hit me. 5. Capacity or potential for effective action: a show of strength. I want the whole package, Body, Mind and Soul. My doctor says that my entire body has become unconditioned. That is a polite way of saying I am fat and out of shape. I will be starting physical therapy again very soon, and then on to an exercise program. I am so looking forward to this. Not because I am an exercise nut, no ugh I hate to exercise, but my body wants to be healthy. My desire for myself is to become physically stronger, and for my creative endeavors to be reflective of this too. I want to convey a sense of strength and fortitude, and the hope of what is possible, even when I create a gentle humble object. Strength, strong and assured. On that note, a peak at a new design I have completed and added to my shop. I hope that it expresses the strength that is found in delicate beauty. 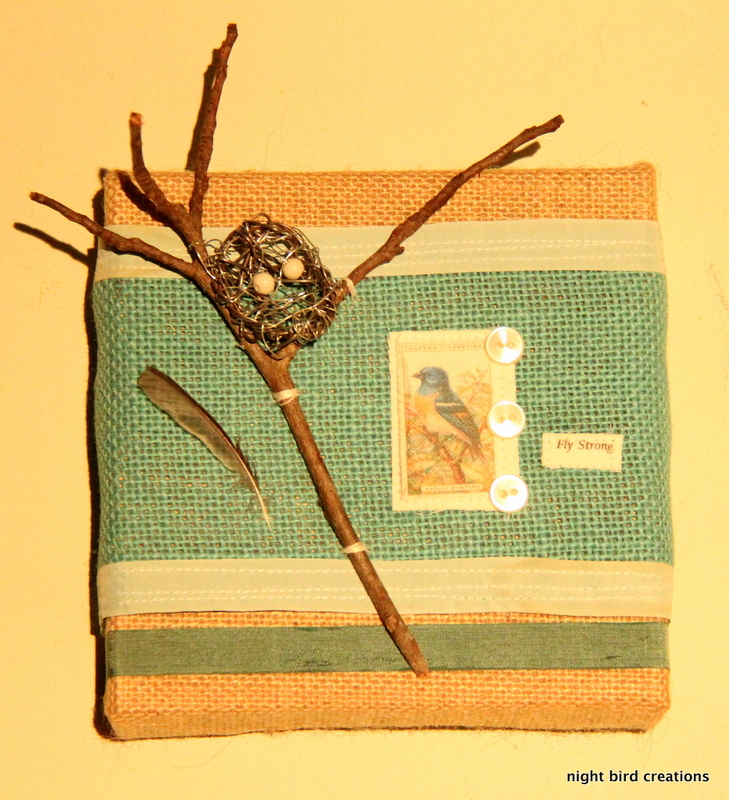 I have sewn vintage seam binding and new vibrant blue burlap together to form a background for the vintage image of a Lazuli Bunting. Remember those cigarette cards I scored the other week? I’ve transferred them to fabric. I’ll apologize for the poor quality photos, it is dark and dreary today. 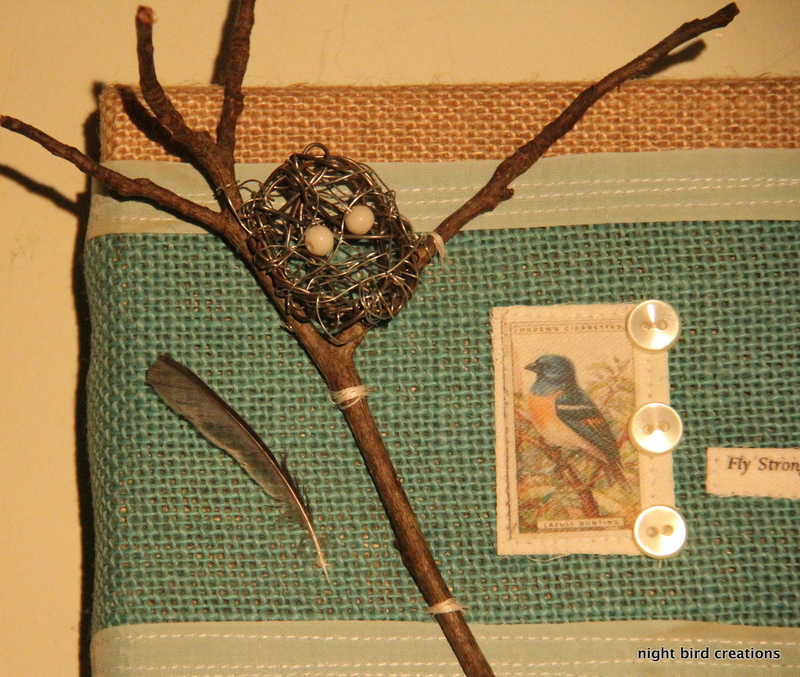 A twig, a wire nest with eggs and a feather for accent. I have spring on my mind – can you tell? 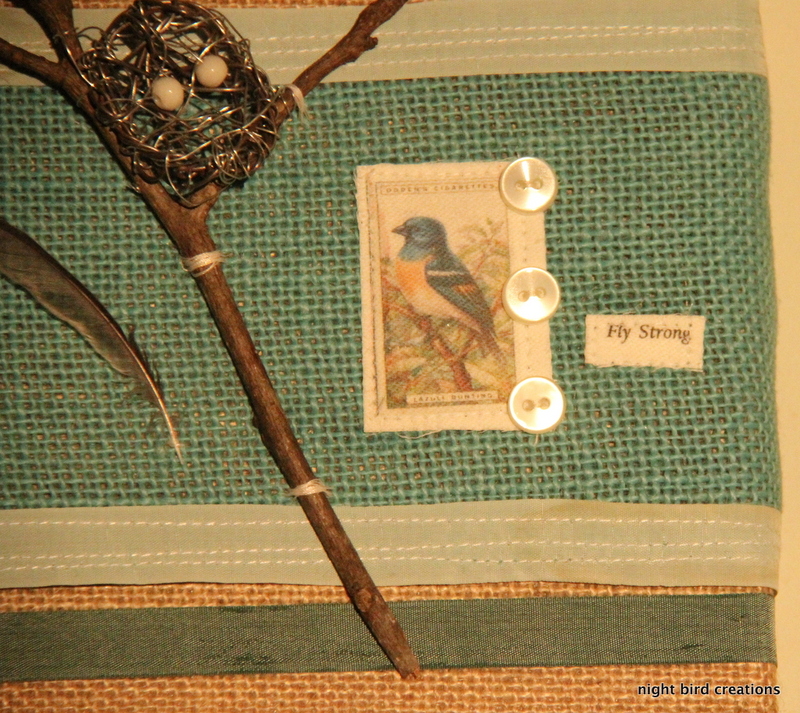 Kim of Red Dirt Farm • This entry was posted in craft, Night Bird Creations, sewing, vintage and tagged fabric transfer, fly strong, mixed media, night bird creations, sewing, vintage bird image, wall art. Bookmark the permalink. Lovely, Kim! The little wire bird’s nest perched in the branch is so sweet. Your growth and strength is already evident in your work. Mind. Body. Spirit. That beautiful balance! What a lovely work of art!!!!!! It’s so charming . Youwr cweative bwain is workin’ again!!! Hee hee! YEY!!!! May your angels give you the Strength to stay Strong!!! It’s sounds like it will be a great year! Spring will be a wonderful time for you to get strong and as the new leaves emerge so will the new Kim. 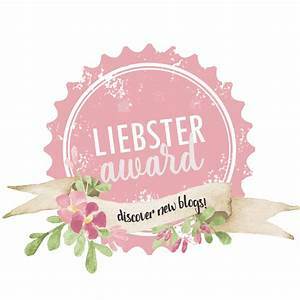 Your bird is lovely and congratulations on your Night Bird Creations Shop! You can be healthy! I’m for you!!!! I forgot to wish you a happy birthday-I hope you had a great one……take good care. Walking is terrific exercise -I do it daily in good weather, and use our elliptical when it’s rotten outside.